Currently, the internet is alive with discussion of public education in British Columbia and I’ve gathered a few elements from different sites to create a composite of opinions that reflect my view that an unnecessary dispute serves no good purpose. Ian Reid wrote about Liberal maneuvering as they aim to provoke this fight over education. It’s part of a game of divide and conquer through which strategists hope to arrest the party’s free fall. Without reversal of fortunes, next year most Liberal MLAs will be resuming their regular, mostly less remunerative, careers. Luckily for them, unhappily for taxpayers, most defeated members depart with generous severance pay and pensions. Yikes. However, I too heard rumblings out of Victoria that Liberals consciously chose to proceed with Bill 22 in a form their legal advisers believe will not survive court challenges. However, the political aim is conflict, not good government. “The B.C. Liberal government is poised, once again, to violate the legal rights of workers, this time with Bill 22, which, if it becomes law, will prohibit teachers from striking and limit their collective bargaining rights. “In 2007, the Supreme Court of Canada ruled that the government had violated the Canadian Charter by imposing legislative restrictions on the rights of health workers to bargain collectively. 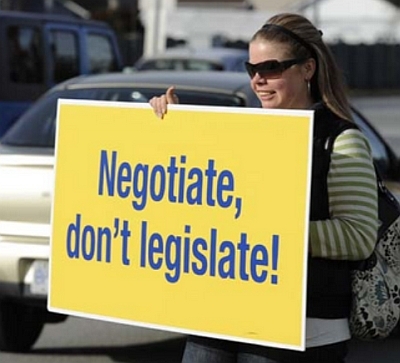 In April 2011, the British Columbia Supreme Court followed that decision to rule that legislation concerning teachers was unconstitutional, and thereby invalid, because it prohibited bargaining on class size, class composition and the ratios of teachers to students. “It is those very same restrictions that the government now seeks to reinstate with Bill 22, a disturbing disregard for such a recent judicial declaration that they are constitutionally invalid. While researching previous court action, I noted something that reflects devious behaviour of the education ministry. It may also explain why high level mandarins seem to have keys to the treasury. A cynic would suppose that people doing dirty work get to extract special rewards. Rick Davis, a superintendent of achievement in the education ministry, had the highest expense account of any provincial employee in the last fiscal year. The amount: $77,657. “ However, Mr. Davis’s knowledge of problems was collected from school administrators. Mr. Davis did not have any first-hand knowledge of the problems cited, all of which were based on hearsay. Clearly, the Liberals have not been playing an honest hand for some time. In 2011, the courts slapped the government over unconstitutional legislation but Justice Griffin gave them until April 2012 to resolve the issues. Instead, the Liberals are bringing in new legislation that will certainly be found unconstitutional too. But, they stoke the fires of political confrontation and push issues down the road to shortly after next year’s scheduled election. It’s a devious strategy, designed to produce conflict. If they succeed, they’ll consider themselves brilliant strategists. If they don’t, the next administration gets to deal with one more stinky mess. Public education will suffer, children will be disadvantaged and respectable teachers will be disparaged. Liberals are ok with those effects if it gains them political advantage.They are dishonourable and unscrupulous – but consistent. We are reaching the end of a long run of corrupt government brought to us by ignorant politicians, who have more in common with Charles the First, rather than 21st a century concept of democracy. The evil this bunch of vacuous thugs have done will take decades, if ever, to eradicate from the province. The taxpayer should just “go postal” with the Liberals and see what is left at the end of the day. Wow. When I emailed my local MLA with concerns about bill 22, he cited language not unlike that of Mr. Davis. I am left to assume that my MLA or his staffer failed to read the reasons for judgement in this case! Your phrase rang a bell for me here in Coldstream, BC, although my comment is not about the teachers' dispute or the government's response to it. Illegal acts (including extortion of private land) by Municipalities is occurring. Our council justifies its illegal actions by offering: “The local government act gives council broad powers.” Indeed. In other words, go ahead and sue us, says the muni. There's no way a resident can win. And just to prove that, the municipality has held up a resident's building permit application for ONE YEAR! Rather than taking space away from your topic, the following blog link has letters from residents, and one from a realtor stating the ramifications of Homeowners now being considered Developers. Further details are provided in previous months' articles. I used to think B.C. meant *Bring Cash*. Now it's *Be Careful*, 'coz your home ain't your castle in Coldstream. BC is the most corrupt province in Canada. The rot really set in with Campbell, especially when he turned traitor to BC. Campbell thieved and sold everything he got his dirty hands on. He was working for Harper, and still is. They say, Harper is a Reformer from the days of his very shady party, his Northern Foundation Party of 1989. Now we have Boessenkool, another Conservative? ?…Working for the Campbell/Clark BC Liberals, just as Campbell works for Harper. Harper and his Conservatives nor, the Campbell/Clark BC Liberals, have any ethics or morals, what-so-ever. The entire evil lot of them, should be exiled out of our country. They certainly are not Canadians. Their stink has been smelled, as far away as Australia. Is there anything taxpayers can do to get back the money this davis has been stealing from our kids? I am beginning to think that the taxpayers paying for these morons should be demanding investigations and criminal charges against this guy. How does this arrogant s.o.b. think he deserves to spend six thousand dollars a month of public money on meals etc when probably stepping over the homeless on his way to the pork barrel. How do we get his phone number I would really like to tell this swine off! Actually quite easy to get his contact info with , I suggest people google or Bing get his email or phone number and let him know how they feel about his expense account! And the fact schools are being underfunded so the likes of him can spend 6k a month on meals. He is a public servant and as such should be held accountable by the people paying his wages! Fraud … by anyother name….misappropriation of funds, expense accounts not tied to work actually done, whatever you want to call it, is just that, truly ridiculous. The “fix” as it were, has been put “in” by governments or rather political parties, who say they serve the people, for quite some time now. The “lesson” was learned by them, when Mulroney got handed the envelope by Schiber. What ever you do … don't get caught. Make it “legal”. Morals and ethics, take a back seat to democracy and accountability, in this country. The “arab spring” has shown us, what the ultimate end, of corrupt governments are. While we are no where near that level of “stupidity in government”, it is truly time for us, to wake up and challenge the system, for the future of our democratic rights and to make all those in power “truly” accountable. Screw up and prison is waiting for you, no freebees, payoffs or easy ways out. why haven't the teachers filed for an injunction against this legislation yet? I can't even express just how disgusted I am.